The incident happened during the match between Quetta Gladiators and Peshawar Zalmi on Sunday. In the fifth over of the Gladiators’ innings, Shehzad smashed Riaz for a big six. On the very next ball Riaz bowled Shehzad with a slower one . Perhaps Shehzad was not impressed and raised his bat towards his Pakistan team-mate. Riaz get furious and slanged some abuse words to him. 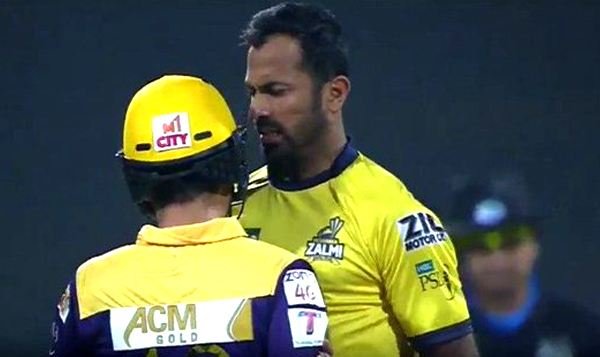 The fight got flared up, both pushed each other but the Zalmi players quickly came in-between to prevent any further contact between the two. Though Zalmi won the match by eight wickets but the incident became the talking point on Sunday and the match ended in bad blood. PCB slaps fines to both the players and gave a warning by the Cricket Board for a heated on-field altercation during a PSL match in the UAE. While Shehzad was fined 30 per cent of his match fee, Riaz was penalised 40 per cent of his game earnings by match referee Roshan Mahanama. “The players have been asked to behave as such incidents hampers the image of Pakistan cricket as millions are watching the PSL around the globe,” a PCB official said. The incident also added more fuel to the ICC decision of using red card in cricket.